Deluxe Inn is a hotel offering accommodation in Hebron. All rooms boast a flat-screen TV with satellite channels and a private bathroom. 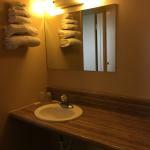 The property provides free private parking and free WiFi. All units at the hotel come with a seating area. The rooms will provide guests with a microwave. Columbus is 39 km from Deluxe Inn. Port Columbus International Airport is 31 km from the property.